Do you know that you don’t actually need a grill to make wonderful grilled chicken and veggies you love? If you can’t resist your urge to get a fiery grilled treat for your taste buds but running low of time to fire up a grill, buy a dedicated grill pan, which is a modern alternative to traditional grill. 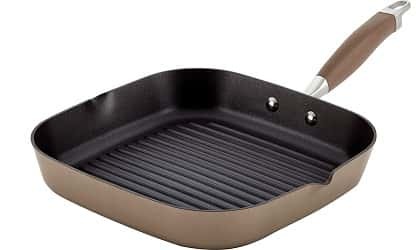 Grill pan is basically a ‘frying pan’ with a range of parallel ridges to cook food with a metal grid or on a stovetop. It is made with excellent heating technology to cook your food evenly while having the assured restaurant-worthy smoke. Grill pan is often referred as griddle, a broad and flat cooking surface heated to cook your meals. Pan should be either flat or ribbed as per your needs. If pan is reversible, it means one surface is flat and one is ribbed. You can reverse it to get the surface for cooking. Choose only non-stick stainless steel pans that are easy to clean and better to cook with. Also consider the sizes and shapes of pans to choose the best pan for you. Also know about the heat source category so you could use the pan to avoid damage. Some heat sources can be damaging and extreme for some materials. This guide has featured some of the best grill pans that are used frequently in many households from the trusted brands to make your life easier. Here are some of the best grill pans to choose from. Here is also some best roasting pan reviews to check. This 10.5” Seasoned Square iron grill pan is made of cast iron to add a modern twist on your dishes. It has grill ribs to collect all drippings and elevate food. Lodge is a leading name which produces cast iron cookware made in America. It has been trusted for natural finish, even heating, durability and versatility. Make restaurant-worthy grilled meals at home like a pro. It promotes low-fat cooking by collecting fatty drippings. It is made of cast iron which is ideal for slow-cooking recipes. It can easily cook foods on a stovetop, campfire or an oven. Calphalon Contemporary Hard Anodized aluminum nonstick cookware is made with multi-layered nonstick coating for superior strength. It has two layers for durability and last layer for smooth food release. It is made of heavy-gauge aluminum for even heating and the body is hard anodized for durability. It is also dishwasher safe for easy cleanup. It has brushed and long stainless steel handles designed to remain cool on stovetop. Covers and pans are also oven safe so it can be best for finishing gourmet meals. TeChef Korean BBQ Nonstick grill pan is made with PFOA-free non-stick Teflon coating with stunning DuPont Print design technology. It is also easy to adapt on any camp burner or even burner with very little heat for even cooking. It is completely non-toxic and doesn’t wear off over time and with heat. You can also grill your favorites with less fat. Its swirl design will help you remove all the fat with its deep holes and pan is tilted towards it. It drains out the oil and cooks well roasted meat without burning. It is also easy to clean up with paper towels. Weber Style 6435 is your perfect go-to grill pan. This professional grade tool fries your goodies on the grill. Prepare very delicate or small foods like vegetables, delicate fish and even drupe fruits with ease. You cannot prepare these foods in normal catering settings or they may lose their quality. The pan features wide carrying handles as well as slits so oil can flow out and can be collected. It has 1/8 inch of partitions and is made of high quality 430-grade stainless steel so it can be long lasting and can retain heat for longer. Kitchen + Home Stovetop Smokeless indoor BBQ is made of stainless steel and comes with non-stick dual-coated surface. It is one of the easiest ways to cook outdoor BBQ grilled food inside your home. Start eating tasty and healthier food by cooking with this stovetop grill without spending much effort and time. Reduce cholesterol and fat in foods and lock the juices and flavor when it comes to grill steak, shrimp, chicken, kabobs, fish, vegetables, burgers etc. It is a non-stick stovetop grill to cook all types of veggies, meat and thawed food without butter or oil. If you love searing your favorite veggies and proteins, Vremi Smoking’ hot pre-seasoned cast iron square pan is build for perfection. It is your best go-to grill pan for high heat cooking without any added fat. 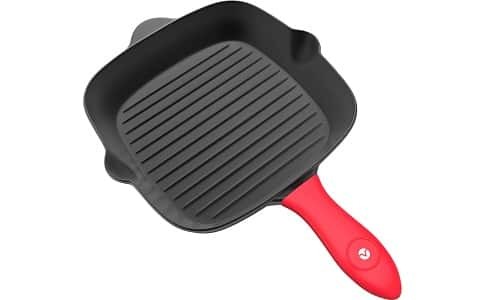 Made of pre-seasoned, heavy-duty cast iron, this pre-seasoned grill pan is oven safe up to 480F and it includes red silicone and protective cover. The pan gains more taste and longer durability with ideal care. The more you use, the more this pan adds flavor to your dishes. 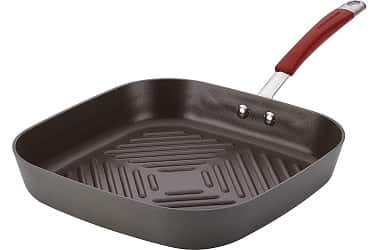 Lodge L8GP3 cast iron grill pan is a great addition to a campsite or your kitchen. The cast iron grill pan has deep ridges on the bottom for grilled chicken, steaks, shrimp and hamburgers. These ridges smoothly sear the food and keep it over the pan fat for healthy cooking. It is made of cast iron for excellent heat retention, browning your meat with delicious and moist texture. The grill pan also has strong handle with notch design for hanging and side lips to pour off liquids or grease. This cookware is virtually indestructible whether used in kitchen or camp and can last for generations. 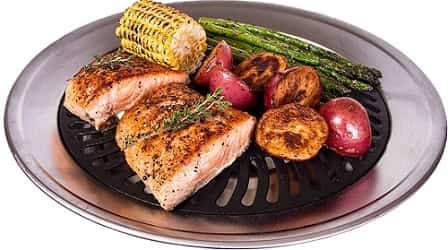 Cook healthy and mouthwatering grilled meals at home with this advanced bronze non-stick hard-anodized square grill pan from Anolon which features pour spouts to remove oil and fat. The nonstick exterior is made of bronze and interior has got the rich chocolate-colored design. It has hard-anodized build from base to rim for maximized, fast heat distribution for superior grilling. The interior cooking surface has two nonstick ridges which are PFOA-free, DuPont autographed and metal-utensil safe. It is designed well to prepare chicken breasts and sliced veggies with appealing grill marks. Nordic Ware Cast Grill N’ Sear Oven Pan is designed to sear and broil meat just like restaurant. Its cast aluminum non-stick grate is the real secret. It remains smoking hot even after 3 minutes of preheating. You can add the tasty seared lines when touching food to the hot grates. Complete cooking under the broiler and drippings are collected in its stainless base. Grill your favorite dishes indoors with beautiful sear marks through the rustic Rachael Ray Cucina non-stick hard-anodized 11” deep square grill pan. It is designed well for even, fast heating and to lower hot spots which can burn foods. The bottom of the deep pan has ridges to add delicious grill mark to juicy steaks, seasoned Portobello mushrooms and marinated tiger prawn while leaving extra fats and oils. If you are looking to purchase a grill pan, the following features must be kept in mind in order to get the best product in the market. Material of the body – Grill pan can be constructed of cast iron, anodized aluminium or stainless steel. Cast iron is the ideal material for a grill pan because cast iron retains heat perfectly at high temperatures. Stainless steel and anodized aluminium grill pans are not able to retain heat well even though they heat perfectly. They are also light in weight as compared to cast iron grill pans but score less in retaining heat. Enameled or Bare – Enameled coating on the surface of the grill pan makes it suitable for cooking acidic foods. Enameled grill pans are also easy to clean because food particles do not stick to the surface. If you want to purchase a stainless steel grill pan, then an enameled pan is suitable because uncoated stainless steel grill pans are difficult to clean. Enameled coatings have a short life span. Bare preseasoned cast iron grill pans heat more evenly and easily tolerate high cooking temperatures. They are long lasting because they can be reseasoned. Bare grill pans are also less expensive than enameled grill pans. Shape – Grill pans are available in many shapes. However, a square shaped grill pan is a suitable choice because square shape provides more surface area for grilling. Square shaped cast iron grill pans are particularly suitable because even the corner farthest from the heat source will maintain a good temperature because of high heat conductivity of cast iron. Round or rectangle grill pan can be purchased if you want to grill the food in a different manner. Handle – The handle of the grill pan should be long enough to keep the hands at a sufficient distance from the intense heat source used for grilling. Long handle increases the weight of the grill pan especially in case of cast iron pans. There are many types of grill handles with short handles in the market. You need to be extra careful if you purchase such a grill pan. A loop or a tab on the handle helps in easy lifting of the grill pan. Bare: In case of bare grill pans, the following instructions need to be followed. Bare grill pan must be cleaned using a sponge and hot water. Soap water must not be used. To remove sticking food particles, you need to make a paste of kosher salt and water and rub this paste over the particles using nylon brush or sponge. Thereafter, rinse the pan with water and dry it with a towel. The grill pan should not be left in water for a long period of time as this causes rust. Bare grill pan must be cleaned before it cools to avoid the build-up of oil and food particles. Enameled: The following instructions should be followed for cleaning enameled grill pans. Wash the grill pan using hot soap water and sponge. Carefully remove oil and food particles using your hand. In case of stubborn food particles, put half an inch of water in the pan and boil it. Boiling softens the hard food particles. Now wash the pan again. Nylon brush can be used to scrub the pan. However, abrasive pads should never be used because the enamel can be damaged. Some types of enameled grill pans are dishwasher safe. Cleaning must be done only after the pan has cooled. Caring and maintenance of grill pans is necessary to enhance their longevity. Some instructions have been mentioned here. 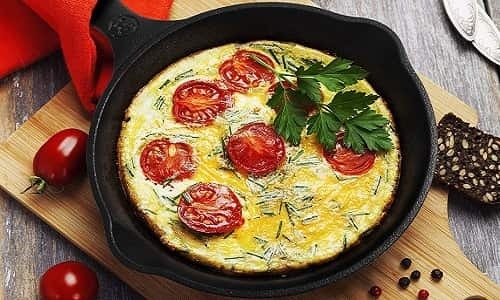 Bare cast iron pans come preseasoned. However, you can add an extra layer of seasoning. The steps for seasoning are as follows. Heat an aluminium foil to 325F by keeping it on the lowest rack of an oven. Apply a thin layer of oil on the pan and use a clean towel to spread the oil layer evenly. Place the pan upside down above the rack having aluminium foil in the oven. Turn off the oven and let the pan cool in the oven. Do not cook acidic food in bare grill pan. Soap and abrasive pad must not be used to clean the pan. Enameled: Enameled grill pans must be stored in a cool and dry place. Towel must be placed between grill pans and other utensils if stored in a drawer to avoid chipping. Conclusion – There are lots of grill pans in the market and it is not easy to choose the perfect one. This is when you should consider the above list of grill pans which are made by considering customer needs and they are available at reasonable prices. We hope this list will help you pick the best grill pan as per your budget and needs. Each pan is built for different needs of customers.